How do I build muscle? Is a question is not only anyone who is concerned about the way they look will ask, but also anyone who want to become physically stronger and more energetic? Building muscle can also strengthen your bones, diminish signs of aging, burn calories and boost your immune system. Building muscle can be done by anyone including skinny people and persons with a high speed metabolism. Building Muscle will add muscle mass to your body and give you a great looking physique that could turn heads and lead to a higher level of confidence. Not only men can build muscle, women can build muscle too the only difference is, they will not be able to gain as much muscle mass as men. The three core aspects of building muscle are eating right, working out and resting. The three must work together in a well outlined plan for an individual to build proper muscle mass. Before we go into more details of these three aspects of building muscle, let’s briefly learn about the process that lead to muscle growth in the body. When you start your muscle building program by working out, your body will break down muscle tissue. The more you workout the more muscle tissues are broken down. When you stop your workout session, naturally your body will rebuild the broken down layers of tissue but stronger and stronger after each session of working out and stop so the tissues are not broken as easily like the last time. Over a period of continuous breaking down and rebuilding, your muscle will grow and adapt to the strain you put on it. The size of your body will start growing with increased muscle mass and strength. 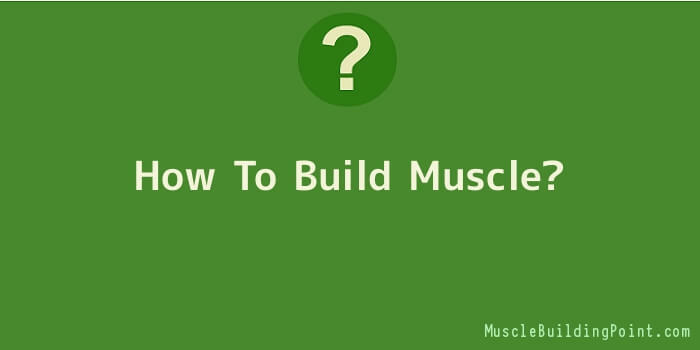 Now, with that learned, let’s now find out how each of the three basic requirements works to build muscle. You must give your body the food it needs to build muscle. For muscle tissues to repair and grow stronger it needs nutrients and energy from food. Protein, carbohydrates, fat and fruits and vegetables must be eaten in abundance so the body can get enough calories for muscle repair and recovery. The most effective way to work out to build muscle is lifting weights. Other forms of exercise such as body-weight exercises and cardiovascular workouts can build muscle too but will not produce impressive results for someone who want to build real muscle mass. Weight lifting also known as weight training will allow you to strength train by starting light and adding weights as you progress for heavier lift. The heavier you lift the better, because more weights means more stress on the muscle which is really what is needed for muscles to grow. Giving your body enough time to rest between workouts is a very important requirement of muscle building. This is needed for the recovery process to take place. In fact, muscles only grow when you rest because when you rest calories (energy in food) is used up to repair the muscles which then heals and create stronger muscles. Working out too often without giving your body enough time to rest will kill the recovery process and prevent your muscles from growing. To build muscle, you’ll need a well outlined plan to show you exactly how to eat, how to work out and how much time to spend resting to archive your muscle growth. Different people might need a different type of program according to their situation. For instance, skinny people with a high metabolism may need to take a different approach to eating and working out than someone with a slow metabolism.